The Wiggle Settings section in class settings allows you to define how you want to display the volume data associated with a class in the wiggle mode. Note: Make sure you have selected the Wiggle check box at Show in the Volume tab for the volume you want to display the wiggles. In the tree, select the class which you want to define the wiggle settings. Traces/cm (0=all) — Type the number of traces to be displayed per centimeter. By default, it is set at "5.0". If you set a value of "0", then all traces will be displayed. Flip Polarity — Select this check box to flip the seismic polarity for wiggles display, that means negative peaks become positive and vice versa. Tip: To flip the polarity of density display, you can invert the colourbar as described in Editing a Colourbar use volume maths to multiple the volume by -1 to change the polarity of data. 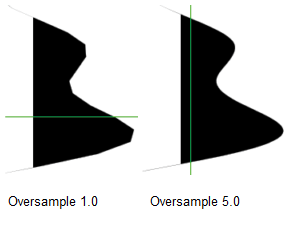 Over sample — Type the over sample value that controls the smoothness of the wiggles. The lower the value, the more jagged the wiggles will appear. Be careful when over sampling the wiggles. A high over sampling value consumes a lot of system memory and can significantly slow the rendering process. Use a low over sampling value and switch to a higher one for final render and presentation generation. Positive — Select a fill colour and/or fill settings style for the positive peaks. 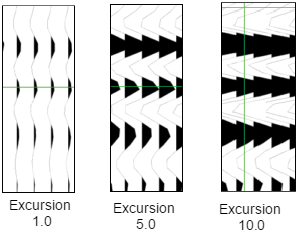 Five fill options are available; no fill, solid, proportional, horizontal and vertical. 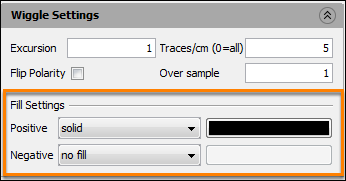 No fill means that only the wiggle traces will be displayed. Solid allows the wiggles to be filled with a single colour. The proportional option varies the strength of the chosen colour based on the amplitude of each wiggle. 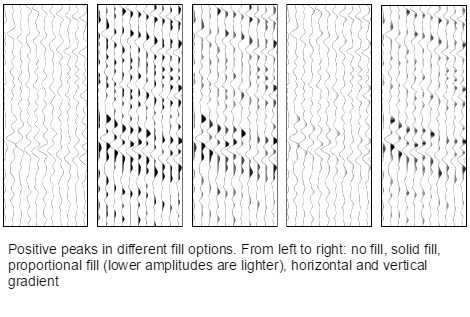 Low amplitude wiggles are displayed with a white fill and the colour intensifies as the amplitude increases. 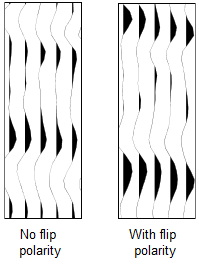 The horizontal and vertical fill options apply a gradational fill from white through to the chosen colour in a horizontal or vertical direction. 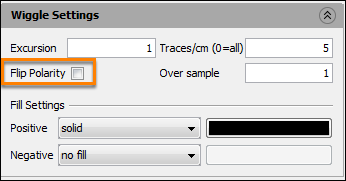 Negative — Select a fill colour and/or fill settings style for the negative peaks. The same fill options for positive peaks applied.